The civil war ended in Mexico in 1860 and the cash strapped new government of Benito Juarez suspended payments on foreign debts incurred by the deposed President Miramon . Britain, Spain and France sent warships to Vera Cruz to protect their investments . Mexican emigres in Paris persuaded Empress Eugenie ( 1826-1920 wife of Napoleon III ), that only a strong monarchy could restore order to Mexico and the empress pressed her husband to intervene . France was riding high in prestige, having recently presiding over the Peace of Paris in 1860 which ended the Crimean War and completed the Suez Canal in 1869 . The French colonial empire was expanding ( the "Second Colonial Empire" ) with the conquest of Algiers and subsequent additions of Algerian territory starting in 1830, Cochinchina (southern Vietnam) starting in 1864 and Cambodia was made a protectorate of France in 1867 . Napoleon III had a more grandiose plan than debt collection when he sent troops to Mexico . Urged on by his own dream of emulating the great Napoleon and his Spanish wife Eugenie, he was determined to make France great again . He also wished to build a canal and railway across the Isthmus of Tehuantepec to make another great engineering feat like the Suez Canal . Napoleon III convinced the Austrian archduke Maximilian von Habsburg that the Mexican people would welcome him as a king . America was too involved with its own Civil War to enforce the Monroe Doctrine and Napoleon sent an expeditionary force of 27,000 to Mexico . As mentioned before, the Spanish and British withdrew their troops when they learned of the French intentions . The French marched on from the coast to Mexico City under the command of Charles Latrille. The French expected to be welcomed by the conservatives and the clergy . The Mexicans dug in at Puebla and heavily fortified it under General Ignacio Zaragoza, where around 4,500 Mexicans troops faced off against around 6,000 French. The French expected the Mexicans to retreat in the face of an aggressive assault and attacked recklessly. The French ran low on ammunition and many of their troops were weakened by sickness . On May 5, 1862, the Mexican forces managed to drive back the French to Veracruz and the date became the major Mexican Celebration of Cinco de Mayo . The Mexicans lost 83 men while the French lost 462. Juarez 1939 starring Bette Davis and Paul Muni, The film focuses on the conflict between Maximilian I, a European political dupe who is installed as the puppet ruler of Mexico by the French, and Benito Ju�rez, the country's president. Upon hearing of the disaster at Puebla, Napoleon ordered 30,000 reinforcements .It was a year before the French army was prepared to march again . The French bombarded Puebla, under the command of General Jesus Ortega after the death of General Ignacio Zaragoza of typhoid fever, for days and forced it to surrender after a siege of two months . The French army under Marshal Elie Forey took Mexico City on May 31 after the Juaristas evacuated north to San Luis Potosi. One battle at this time, that of Camaron on April 30, 1863, in the state of Veracruz became one of the most famous in the annals of the French Foreign Legion . Here, 60 legionnaires under the command of Captain Jean Danjou, who had a wooden hand, met a force of roughly a thousand Mexican guerrillas where they fought until only five legionnaires and Captain Jean Danjou survived. They surrendered and freed in a prisoner exchange . Intervention in Mexico . Click for larger image . On June 3, 1863 the French commander selected a provisional government of 35 conservatives .The executive triumvirate was made up of General Juan Almonte, General Mariano Salas and Bishop Pelagio Labastida . In October 1863 a delegation of Mexican conservatives visited Ferdinand Maximilian in Europe and made an offer for him to become the emperor of Mexico . Maximilian agreed if this was accepted by the Mexican people themselves . A plebiscite was held in Mexico under the control of the French Army, which of course approved him .Before Maximilian left Europe he met with Napoleon and it was agreed that Maximilian would pay the salaries of the French troops which would remain in Mexico until 1867. He was proclaimed Maximilian I, Emperor of Mexico on April 10, 1864. Ferdinand and his wife Marie arrived in Veracruz in May of 1864 where they were coldly welcomed by the local people . On June 12 they arrived in Mexico City after paying his respects to the Virgin of Guadalupe at the Basilica of Guadalupe . An imperial court was established at Chapultepec Castle . Once a week he opened the castle to the public to hear the concerns of the people and toured the provinces. He declared a free press and declared a general amnesty to win the support of the people . To the dismay of his conservative allies, Maximilian upheld several liberal policies proposed by the Juarez administration such as land reforms, religious freedoms, and extending the right to vote beyond the landholding class. The emperor refused to suspend the Reform Laws that would return church lands and even levied forced loans against it . The emperor , a Mason, considered himself an enlightened despot and in addition to this hoped to gain Mexican liberal support . The support of Napoleon began to wane as the Mexicans fought against French rule, but Maximilian and Carlota considered themselves on a holy mission . He drafted a new constitution which provided for a hereditary monarchy, religious toleration , equality under the law and did away with debt peonage . He sought to use the clergy as civil servants and pay salaries in order to do away with tithing and fees . He even named Jose Fernando, a moderate liberal, as secretary of foreign affairs . The liberals, for the most part were not impressed by these actions and Maximilian only succeeded in alienating them both liberals and conservatives. Maximilian consorted with prostitutes, and Carlota out of fear of catching a disease refused to sleep with him, creating a succession issue. This was solved by adopting the grandson of the first emperor of Mexico. Juarez withdrew to San Luis Potosi and then to Chihuahua. French forces then forced his small army further north to modern day Ciudad Juarez across the border from El Paso .The empire was its strongest from 1864 to 1865. Marshal Bazaine defeated Porfirio Diazin Oaxaca after a six month siege. After its fall, the republicans only held four states, Guerro, Chihuahua, Sonora and Baja. In October 1865, the emperor believed Juarez had fled to the US , which was not the case .The emperor then issued the infamous Black Decree decree mandating the death penalty for all captured armed Juaristas. There would be no courts-martial or pardons by the emperor .Within a few days two Juarista generals were captured and shot. This decree, however, was to lead to the emperors own death .The French, however, had trouble pacifying the country due to guerrilla warfare and the French were hated in much of the country for their drastic counter guerrilla actions. Juarez realized he need more support and sought aid from the Lincoln administration, which had never recognized Maximilian's government . After the downfall of the Confederacy, Secretary of State Seward began applying pressure on Napoleon III and allowed Juaristas to purchase arms in the US . Three thousand Union veterans joined the Juarista army and the Mexican coast was blockaded. General Grant ordered 42,000 men under Sheridan to Brownsville, across the river from the imperial army under the command of Tomas Mejia and it looked as if the US would invade Mexico on behalf of the Juaristas, but nothing came of it . After the fall of the Confederacy, General Joseph Shelby and his men rode south into Mexico to offer their services to Emperor Maximilian, who declined to accept the ex-Confederates into his armed forces. However, the emperor did grant them land for an American colony in Mexico. With these considerations and the rising power of Prussia, Napoleon began to withdraw his troops in late 1866 and urged Maximilian to abdicate. This left Maximilian in a dangerous position and considered abdicating his throne, but his wife, saying he must maintain Hapsburg dignity, talked him out of it. She would travel to Europe herself to talk with Napoleon and to the Pope, but to no avail and later suffered an emotional collapse.During the remainder of her life (1867-1927) she believed herself still to be the empress of the Mexicans . 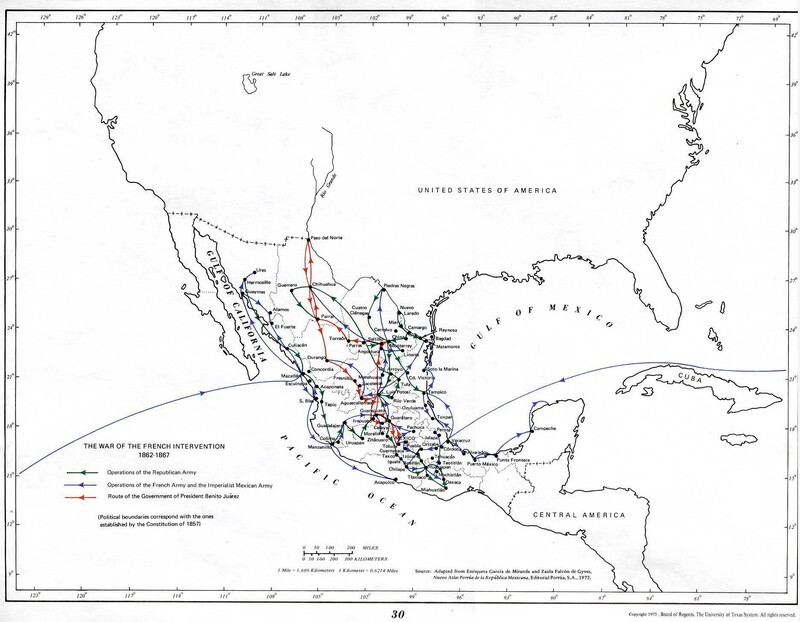 Juarez and his army assumed the offensive in the spring of 1866 .During the summer the republicans captured Saltillo, Monterey, Tampico, Durango and later in the year Guadalajara and Oaxaca. The end came in the city of Queretaro where the last of the French troops in Mexico were marching to Veracruz to leave Mexico under Marshal Bazaine, who urged the emperor to join him. The last French soldier left on March 16. Portirio Diaz, who escaped his captors after the fall of Oaxaca, took command of the army of the East and defeated a conservative army outside Mexico City and put the capital under siege . Maximilian took command of a few thousand Mexican imperial troops but was surrounded by a republican army four times as strong .The battle began on Feb 19, 1867 and the defenders held of the republicans for almost a hundred days .On May 11 he decided to attempt an escape through the enemy lines. However on May 15, 1867, before he could carry out this plan,a member of the imperial cavalry betrayed the emperor and opened a gate to the besiegers and Maximilian was captured , along with Miramon and Mejia . Juarez decided that the emperor would be tried by court-martial, and the emperor's death decree of 1865 that had executed so many left little room for compassion . It was also felt that Maximilian might return and would make the new government look weak . He was also popular and even venerated by some of the Mexican population and it was feared they might rally around him in the future .He was executed by firing squad on June 19, 1867 on the Hill of Bells (Cerro de las Campanas) together with his Generals Miguel Miraman and Toms Mejia.Two days late Diaz captured Mexico City from the conservative armies . Over 50,000 Mexicans had lost their lives fighting the French and the country was devestated after a decade of warfare. However, it was a vindication for the republicans and the Constitution of 1867, the power of the church and conservatives was broken and a sense of Mexican nationalism began to grow .It also introduced French ideas, fashion and culture into Mexico . Liberalism became associated with independence from foreign aggression . However, the lack of a central authority for so long increased regionalism and banditry which would lead to future domestic strife . The Execution of Emperor Maximilian (Manet) Manet's depiction of this historical event borrows heavily from Goya in both theme and visual technique despite establishing a unique method of depiction. Learn more about art as a medium for political and psychological commentary.